Find the top racks to start progressing to realize your full potential. You might think of a rack or cage as something super basic, and ultimately that’s true, but there are a lot of small nuances to keep in mind. Let’s talk about some of the very best power racks out there, what sets them apart, which features you should consider looking for and why. We’ll help you choose the best rack to help accomplish your goals, and also one that’ll grow with you long-term as you bulk up and have more demanding needs. Whether you want to bodybuild or strength train you need a solid power rack to help you achieve your goals. These aren’t the only things you’ll want to keep in mind, but these are 3 significant things to consider to get the ball rolling. If you don’t want to go super in-depth with all of the nuances, these three considerations are still a great way to get the ball rolling. There are certain things that are trickier to order online, even some types of fitness equipment are better to try in person. A spin bike, for example, is tougher to buy without actually trying it first, making sure its comfortable, making sure it rides smoothly… but with a power rack, as long as it does what it’s meant to do, you don’t really have any reason to need to try it out first. This is great because you can save a ton of money by shopping online instead of being stuck with local stores that often have higher margins than online options. Not only that, but buying your power rack online opens up a much greater selection, so that you can compare options really quickly and easily, and grab the one that meets your needs and fits your budget. If you’re a powerlifter who needs a heavy duty rack to hold hundreds and hundreds of pounds under heavy use, where there’s a possibility it gets huge weight dropped on it, and needs to really stand up to serious usage – that’s something to keep in mind. If you’re a little more casual with it, probably not tossing around massive weight, but just someone looking for more of a gym experience at home, you can get away with home-grade equipment instead of needing full-on commercial tier stuff that’ll cost a fortune. The build quality can vary, and most power racks will be more than good enough for the majority of people. A lot of it has to do with peace of mind, too. There are safety features in most good power racks, for example bars that prevent the weights from falling on you if you’re bench pressing, or can even catch the weights before they hit the floor. Measure how tall your ceiling is, especially if you’re looking at a power rack that has a pull-up bar, since you’ll need some extra leeway so you don’t hit your head. You can find smaller, more basic racks that don’t take up as much space – but some of the more serious ones will have a much larger footprint. This is easy, just measure your space and compare it to the dimensions of the product. Once you’ve decided what your needs are, you’ll have a better idea what it’s going to cost you. If any of your needs have flexibility, you can bend to fit your budget, but it’s usually not a good idea to concede important things to fit your budget, you’d be better off looking for a sale. For instance, if you need a rack that can support massive weight (and those are more expensive) buying one that doesn’t support massive weight for less money isn’t a great option. There are some things you can easily compromise on, but others that you simply cannot. Adjustable Positions with 4 Safety Support Bars---The barbell training rack is equipped with durable bar supports. The bars can be adjustable to fit different basement, which allows you to lift heavy weights safely and store your barbells tidily. Heavy Duty Construction---Goplus barbell rack is made of steel frame with a scratch proof powder coated finish, resist rust and corrosion, added extra durability and designed for long-term use. Solid Pull up Bars---The pull up bar is made of 51" solid steel with a weight capacity to 450 lbs. The bar design is very suitable to train your upper back, shoulder and arm muscles and keep fitness. Two liftoffs & Two Safety Rods---Plate loading for pulling up offers a full range of shoulder motion while the lower row pulley can be used for seated rows, upright rows and curls by using the foam cross bar. Helps to build a wider, beefier Back and stronger, bigger Biceps and Triceps. All-in-one Exercise Station---Your military, chest, back, arm and legs muscles can be well trained with this all-in-one exercise equipment. As well as it has a compact size to save your space and can act as your home gym. Let’s start off with something on the cheaper side of things, for the more casual home gym build. The winner in this category is NOT the most basic or budget option out there, but it’s the bare minimum that we would recommend going with. Anything cheaper than this could start to skimp in important areas like safety and durability. 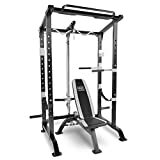 This adjustable power rack by Goplus has 4 safety support bars, which are a big part of why we recommend a power cage over just a basic squat rack for home gyms. You won’t have a spotter in most cases, or anyone else even nearby, so little things like this can make a big difference if you’re ever in a bad situation. While this rack doesn’t have a ton of bells and whistles, it does have a pull-up bar that can hold up to 450lbs. Something to keep in mind with fitness equipment that is rated for different weights: Getting something that can support a much heavier weight just shows you that it’s well-made, even if you don’t weight nearly that much. For the price, it’s hard to beat this power rack by Goplus. 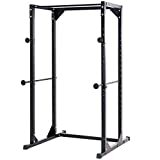 It’s affordable, strong, durable, easy to put together, has safety rods, doesn’t take up a ton of space relatively speaking, has plenty of room for a bench and for squatting within the cage. You’ll want to use an standard Olympic bar with it, some of the smaller and shorter bars won’t fit correctly. This is going to be the case with nearly any cage you look at, but we’re mentioning it for this one since it’s more “entry level” and some of the people looking at it might still have those smaller bars. This heavy-duty rack is perfect for any high-use environment. If you’re putting up some serious numbers, you might want to consider something like this. Is it overkill for typical home users? Absolutely. Is that a bad thing? Not at all! While it’s a very straightforward piece of equipment, it does have some added extras. There’s a chin bar, band pegs for attaching resistance bands, plate horns for holding your plates, and gunracks that allow you to rack and liftoff your bar wherever you’d like, not to mention the safety bars that you can adjust anywhere from about 1-3 feet high. It’s worth noting that if you’re thinking of getting this for your basement, it likely won’t fit. It also comes with a lifetime warranty on the frame and the welds. It’s made very solidly, which is always the peace of mind you want to have when you’ve got hundreds of pounds of solid metal dangling above your skull. The total capacity is 1000lbs. You can get some additional attachments from the manufacturer, but one thing that’s missing is a dip station, so just keep that in mind if that’s a dealbreaker for you. To determine the absolute best overall option, we looked for that perfect balance between value and performance. We wanted to find something that’s great overall, and will serve the largest amount of people at the best price before getting into the point of diminishing returns, where you aren’t getting as strong of a value the more you pay. There were a lot of great options to choose from, but overall, with all things considered, we had to give the nod to the Marcy Pro Full Cage. It’s got more bells and whistles than an entry-level unit, it’s stronger and can support a lot of weight, but it’s still meant for at-home use. It comes with a solid bench that can hold up to 600 pounds, it’s got a dip station, lat pulldown bar, holders for your plates when they’re not in use, and it gets pretty close to feeling like what you’d find in an actual gym – but a lot less expensive. It’s considerably heavier than our basic option, and it’s less expensive than our commercial pick with more features. Overall, this is a rock-solid squat rack/power cage that has what you need for a complete full body workout. For all of those reasons and more, this is our pick for the BEST power rack for your garage gym, or basement gym, or wherever. There are plenty of options out there… Almost too many options. So by doing the research and lifting on these racks has allowed us to give them a thumbs up and make the entire selection process a lot easier for our readers. 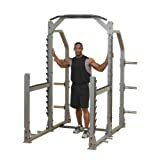 Bottom-line is that any one of these racks is going to do just great for the average lifter, but we’ve broken each of them down for those of you who want something more specific. Let us know what power rack you ended up with.